Since birth, they have been inseparable. In school, even though they were not in the same class, their teachers supported their need to be side by side. Their classes were always next door to each other. They ate lunch, played outside, and went to the bus together. When one got sick, the other got sick and the duo has always been there for each other. As they grew older, music became a therapeutic outlet and they both shared dreams of becoming the next twins in the music industry. Unfortunately, with little money and lack of resources, they turned to the streets to jumpstart their journey. In July 2011, life took a turn for the worst when the twins were arrested on drug possession, trafficking and gun charges. They later fought the case, and with the help of family and the grace of God, they were given 5 years of intensive probation without being able to leave the city. This experience put the twins into overdrive and they started their first project immediately, determined to rise up in the industry. The twins released their first official mixtape via Livemixtapes titled, ScarDByThaStreets, detailing the pain, losses, deaths, tragedies, and their struggle growing up in the streets. The mixtape features DJBando1k, DjSoCincere, and DjShooter1k and production from Cincinnati native, Koonthatrack. Cuntry Cane and Smoke Da Stoner released their second project, Scard By Tha Streets Vol.2 via Spinrilla earlier this year hosted By Dj So Cincere & Dj J Dough. 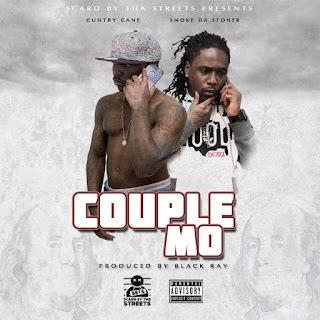 Check out the official audio to their new single, “Couple Mo”. The official music video will be released 4th of July!